We are very saddened to hear of the death of Arthur Trunchion on 10th January only a matter of weeks after he lost his beloved June. Arthur had been unwell for some time but had so hoped to return to our monthly lunch. A memorialservice will be held on 24th February at 3.30 p.m. at St John’s, Old Coulsdon. 28 members were present plus our speaker, Malcolm Wells. Almoner, Andrew Kellard reported the absence of Arthur Trunchion, Derek Bass, Lionel Downton, Peter Wilson (in East Surrey following heart attack), John Morgan (chest infection) and Roger Gourd (pace maker fitted and since out of hospital –attractive nurse). If you, your partner or another member is unwell please contact our almoner, Andrew Kellard on 01737 554055. Also temporarily for lunches – please notify Andrew by 10.30 am the prior Tuesday. Andrew himself has been unwell, so we were pleased to hear him grump about nine lunch order changes in three days. The Charity Collection raised £55.35 and the raffle £31. Seven birthdays were announced for January with a special mention for Tony Simpson age 90 and Norman Pollard age 91 – both unfortunately no longer able to make it to our lunches. Dennis Evans told us (back page of the Probus Magazine) about free travel for those with a hearing impediment. Ian Payne appealed for articles for the Newsletter. January’s issue had, as usual,contribution from yours truly and Vincent Fosdike who has volunteered to take over the editorship from April. Reg Baker pointed out that there are only 36 members who regularly attend – an issue for the Committee. Several members praised the quality of the meal and the excellent service since new management. The Sports Club have since confirmed that their price will rise by £1 per meal but this has been anticipated in the new member charge of £22 from April. How delightful to see this heading again although we haven’t been idle duringour 50th Anniversary last year. Andrew Banfield has volunteered to take on the role of Outings Secretary. We hope to fill all our posts at the AGM in March. Nominations are due at this (February) meeting – see Editorial page 3. It’s not often you have a speaker whereone doesn’t know what he’s going tospeak about – the title is ambiguous. But it turned out that Malcolm was speaking about himself and the title was good news. Malcolm is now a fundraiser for Canine Partners who train dogs for people with disabilities. But back to the beginning, leaving school at sixteen with an A level playing the cello, but having no other qualification. What sort of career would Malcolm choose? How about the orchestra of the Royal Artillery? You’ll get an opportunityto tour the world and it doesn’t matter that you’re only five feet tall. And so he did, initially touring Europe then appearing at the royal Albert Hall in a Prom concert and then an engagement at Kensington Palace. The breakthrough was to entertain the Monarchs League at Buckingham Palace. These are private gatherings of royalty and ex-royalty from across Europe. Malcolm was part of a string quartet. They had to plan the programme weeks in advance – they decided to play a piece suited to each of the nations who would be present. A Strauss waltz for the Austrians, something for the Spanish and the French but what about the Danish – ah, a piece from the musical Hans Christian Andersen. The concert was goingwell until . . . “The King is in the altogether” – perhaps not appropriate for the King of Denmark! The royal party were in stitches but Malcolm was worried about promotion prospects. 9 a.m. next morning in the colonel’soffice – he was relaxed, then the Daily Mail’s headline ‘Orchestra PlaysInappropriate Music’ – but they got away with it – everybody got the joke. During the Northern Ireland troubles, the orchestra went to Chester to re- train as paramedics then off to N.I. where they were barracked in the Maze Prison for two months. After four tours, the Orchestra came home – 85 members were at Woolwich to learn new instruments for their new rôle as a marching band. They played at the Queen’s birthday engagement then at(old) Wembley for the England/Brazil match – was Pelé there? They played the BBC ‘Match of the day’ theme tune (for an ITV audience) as the teams formed up and, of course, the national anthems in full – Brazil 71⁄2 minutes. The orchestra were again re-trained, this time as medics, for Kuwait. They flew out from Brize Norton and were then escorted by four Tornados from Cyprus to Saudi where they set up their hospital in two days complete with operating theatre. Two field hospitals were set up ten miles beyond the front line. It was just like M.A.S.H., helicopters and all. The evenings were quiet except one day an almighty thud turned out to be a Scud missile which landed 100 yards away – fortunately it didn’t go off. Back to England and musical duties. Played to 70 to 80 thousand at the annual parade in Malta then finally the ‘last post’ sounded. Malcolm retired to Chichester near the RMP barracks. Malcolm told us some poignant stories about working for Canine Partners. One partner wanted a black Labrador but the only dog to befriend him was a poodle. Another dog did the washing – in and out of the washing machine and hanging the clothes on a (low) line. More recently Malcolm joined ‘Literacy in a Box’. Eachbox has enough material for 25 pupils for one term and is sent to Africa and India etc. No one at the charity receives a penny. 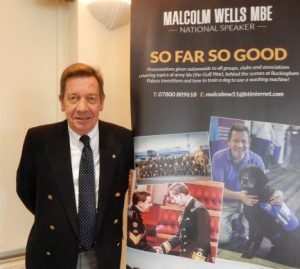 Malcolm was awarded the MBE for his charity work. AGM: Our annual General Meeting is on 7th March 2019. All Committee members step down and new members are elected. Nominations, including self-nominations, are due at this (February) meeting for the following posts: Chairman, Vice Chairman, Secretary, Treasurer, Almoner, Membership Secretary, Speaker Secretary, Outings Secretary, Newsletter Editor, Website and most importantly, Luncheon Secretary – please consider this. Some of the Committee are willing to stand again and some Members have already indicated their willingness to stand. If we have more than one member for a post there will be a vote. Only the principle four posts have to be Committee members and I know there are some potential volunteers who would rather carry out their duties from outside the Committee. But we are looking for nine members on the Committee so we will also need some non-post-holders to put themselves forward. An auditor has to be appointed. As you all know, our numbers are dwindling as we get older and succumb to the vagaries of life. We hope to have a full committee for the coming year but, unfortunately, the way forward for our club will be high on the agenda and we may have to re-open some difficult issues. My first job on leaving school in the early 1950’s was with the Daily MirrorGroup. In those days careers in Fleet Street and the printing industry were, in general, a family affair – one had to have family ties to the industry. My passageway to the Mirror was by a neighbour who worked at the Daily Mirror and perjured himself by pretending to being my uncle. The Daily Mirror was based in Fetter Lane, just off Fleet Street, and had suffered from the blitz during the war. Part of the building, Geraldine House, had been flattened, a porta-cabin type of construction was used on the bomb site as a sports and leisure building. When I was at school I was in the school boxing team and was a member of Croydon Amateur BoxingClub, so naturally I joined the Mirror’s boxing club which had regularcontests with the other Fleet Street papers and magazines. One evening whilst training in the leisure centre for an upcoming tournament against the News of World, Tommy Farr walked in. Tommy Farr, the Welsh Giant, was one of the greatest heavyweights produced in the UK. He fought Joe Louis to a standstill over 15 rounds for the world heavyweight championship with most commentators considering Tommy the winner, but the American referee scored it 13 rounds to Louis. The crowd booed the result and Joe Louis later considered it one of the toughest fights of his career. Tommy retired in 1940 and in the 1950’she was the Mirror’s boxing commentator. This position involved Tommy wining and dining celebrities with a ghost-writer writing his column. On this particular evening Tommy joined us after a hard day’simbibing. Taking off his jacket and in his shirt and braces, he stepped into the ring. Putting on a pair of sparing gloves, which were bigger and more padded than fight gloves, Tommy stepped up to me and with his hands on his hips told me to hit him in the stomach. Tommy Farr the former European and British Empire heavyweight champion towered over me at well over 6 feet tall and, at that time, well over 19 stone in weight. He stood over me looking like the giant he was. I stood there like a mediocrefeatherweight looking like one of Lowry’s Matchstick Men. Nervously I punched Tommy, he chuckled, stretched out his right fist, and I was sent cartwheeling across the ring. Our trainer went ballistic at Tommy and ordered him out of the building. For many years, after a pint or two, I would proudly claim that my proudest moment in boxing was when I was knocked out by Tommy Farr. But nowadays most probably nobody under the age of 60 has heard of the Welsh legend.